Heritage Shores has plenty of ways to stay active indoors and out. One of the highlights of active adult communities is that they are in fact designed for active adults. Fitness centers, yoga and dance studios, pools, and exercise classes all provide great opportunities for residents of 55+ communities to stay healthy. Exercise can have a tremendous effect on our bodies as we age, from increasing flexibility, balance, and mobility, to reduced risks of heart disease and developing certain diseases. A recent study by the Gerontological Society of America even saw increased brain volume in people over 60 who exercise. Here are the best three communities in Delaware for active adults. The highlight of Heritage Shores in Southern Delaware is the golf course. The large community of single-family and attached homes surround the championship course, designed for all levels of play. While walking 18-holes of golf and carrying a bag is a great way to get exercise, even riding in a cart, swinging, and walking around the green can burn as many calories as a 4-mile walk. Located next to the clubhouse and pro shop, the fitness and aquatic center provides year-round options for exercise. 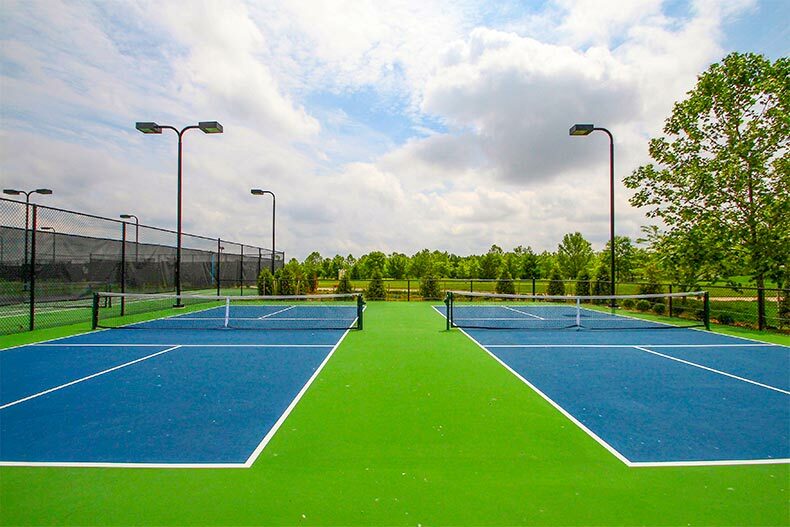 Residents can choose from a variety of activities like working out in the fitness center, swimming in the indoor or outdoor pool, or playing tennis. Residents can also enjoy fitness and dancing classes like Zumba, ballroom dancing, and stretching. Independence by Schell Brothers offers new and resale single-family homes. Located in Millsboro, not far from the Delaware beaches, this community offers residents resort-like amenities with plenty of opportunities for exercise. Outside, residents can enjoy walking and biking trails, the community garden, volleyball and tennis courts, and an outdoor pool. Inside Independence Hall, the centrally-located clubhouse, group classes include Tai Chi, Yoga, and Aquacise. Residents can also enjoy swimming in the indoor pool, exercising in the fitness center, or relaxing in the saunas and massage rooms. Also located in Southern Delaware, Bay Crossing is a community of 256 homes offered for resale. Although the community is smaller, active adults will enjoy the amenities it provides. Although the clubhouse does not have a separate fitness center, residents keep active with the clubs, classes, and groups organized by residents and the fitness center. These include ladies’ and men's tennis and golf groups, the Bay Crossing Walkers, yoga and Zumba classes, and dance clubs.